I first started needing eyeglasses when I was about 20, and I've been wearing them 24/7 since age 30. Fifteen years after that, my vision has taken an interesting new turn: I need reading glasses. I've become that old lady who looks over the top of her glasses to read medicine labels and cereal boxes. My aging corneas can no longer adjust when switching from long-distance sight to short-distance sight. I've never needed or wanted more than 1 pair of glasses at a time, but now I find myself wanting to own at least 3 or 4! 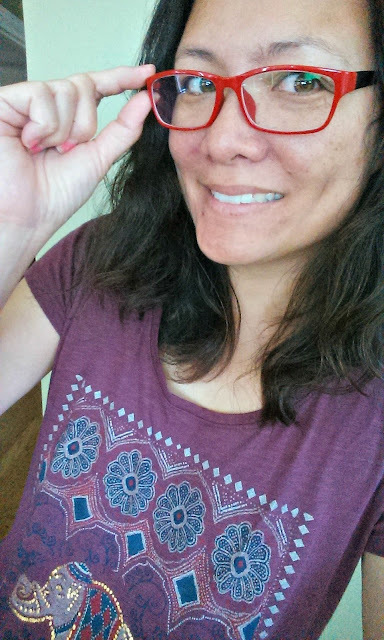 I can't quite get used to progressive lenses just yet, and there is no way I will ever get bifocals, so I need 2 kinds: my regular glasses and my reading glasses. The problem is that I refuse to carry around 2 pairs everywhere. My mom used to have both pairs of glasses hanging on chains from her neck, and switch around when needed. Um, no. I just want to have my reading glasses lying around where I need them most: on my bedside table, at my computer desk, in the living room for watching tv, and in my purse. I never thought I would need to look at buying glasses online, because the one pair I needed was always covered by vision insurance. But now that I want multiple pairs, I'm thinking that sites like GlassesShop.com are going to be essential! They sell inexpensive frames and lenses so even if you don't have insurance, purchasing prescription glasses and prescription sunglasses doesn't have to cost an arm and a leg. GlassesShop.com offered to send me a pair of glasses, and now I'm hooked. Ordering from them just couldn't be easier. Just pick your frames and lenses, upload a copy of your prescription, and you'll have them in no time! They have a great choice of lenses starting at unbelievably low prices. I know, I sound like an infomercial, but $25 for frames?? I've never seen frames that low in any brick and mortar glasses shop, ever! Not only that, but when you purchase frames, you also get single vision lens, anti-scratch coating, a protective case, and a microfiber cloth included for free! Lens enhancements (i.e. progressives, tinted lenses or sunglasses, polarization, transitions, polycarbonate, etc...) do cost extra, but they still charge less than my regular shop. I'm so happy with how these glasses turned out! The red frames are adorable (I've always wanted red frames, but couldn't commit to wearing them 24/7). Already I've gotten several compliments on their sassiness and style. The lenses are basic lenses (i.e. not polycarbonate) but they are very light; the weight of the frames + lenses don't bother me at all. Now that I need reading glasses, I can try all kinds of styles! If I had to buy 3 pairs of reading glasses from my optician, I would probably end up paying $300 per pair after the first pair, but with GlassesShop.com, I can get a basic pair for less than a movie ticket. The lowest full price I saw was $15, and the lowest sale price was $6! And with discount code GSHOT50, you'll get 50% regularly priced frames plus free lenses!